This treatise is meant to preserve this knowledge of how the greatest instrument makers in history thought about sound and how to enhance it. Back in the early 1990’s of the last century, my brother Robert Hill asked me to resoundboard a Grotrian Steinweg concert grand piano that he had just purchased for the purpose of getting it rebuilt acoustically to be optimized to the fullest extent of what was possible at that time. I was living and working in Manchester, Michigan where I had my harpsichord shop. He was living and working in Freiburg a. B., Germany. I agreed to make a new soundboard and tune it according to my acoustical principles if he sent me the original soundboard intact in Manchester. Well, when I got the original soundboard and tapped on it, what I heard had all the musical qualities of a door…as in “dead as a door”. Undaunted by the abysmal amusical properties of the original, I used it as a template to build another soundboard, which I tuned and proceeded then to reuse the old bridge, with some acoustical modifications, and apply the many ribs where I thought they should be glued on instead of following the common practice used by all modern piano makers since 1850. Finally, I shipped the soundboard back to my brother in Freiburg, where he had it installed into the body of the Grotrian Steinweg case. Later, when I visited Europe to buy more soundboard wood, my brother asked me to spend as much time as needed to completely acoustically adjust the action on this Hill - Grotrian concert grand piano. This I did, which radically improved the playability of that piano. Other than hearing one or two pieces Robert used to test the piano out before I departed, I never again heard that piano. Thereafter, Robert had the hammers replaced with ones made from rabbit felt and had the bearings in the piano replaced to refresh the touch and to make it more responsive. Otherwise, I never actually heard that piano until I received a recording of a concert performed on it earlier in 2018, a program of all Albinez music played for a Master’s degree recital by one of his students at the Hochschule für Musick in Freiburg. That is the first time I have actually ever heard the results of my acoustical work some 25 years earlier. The recording offered below was recorded live by Professor of Harpsichord, Mark Edwards, at Fairchild Chapel in Oberlin, Ohio on September 27th, 2016 on my harpsichord, a copy of the 1624 Ruckers harpsichord in Colmar, France. I made the instrument in April of 2016 and finished the instrument in September. The photo below is of Prof. Edwards preparing for the concert on that harpsichord when the instrument was in the conservatory building the afternoon of the concert. This instrument is presently for sale. Since I began building instruments in 1971- 1972, I have made more than 494 instruments for professional musicians and serious amateurs alike. In all that time, I have received only half a handful of thoughtful well considered critiques about my instruments. That makes a review written to me recently by Jan Katzschke of Dreseden, Germany all the more interesting. As most of my readers already know, I base my work exclusively on aesthetic and musical principles that I submit myself to and apply as faithfully as possible. The less of my self I interject into the business of making an instrument the better. This review, see below, is an affirmation that my decision to govern my instrument making behavior according to these principles was not made in vain. Last weekend I played the first three concerts on the Taskin and the result was absolutely amazing and in that degree unexpected for me. First (what I enjoyed already at home): The resonance, bloom, transparence, dynamic ... of the instrument is uniquely rich. The touch is absolutely delightful, like moving my hands in warm water. The dynamic is absolutely amazing, if I want to emphasize a single tone or theme of a middle part of the score, only the intention is enough to make the instrument immediately react dynamically. I know this partially from other instruments, but this one is far beyond everything I know elsewhere. Every single tone is singing on a maximum degree. Before writing all this to you, I wanted to await the first concerts. As I told you, I played a French programme together with a violinist, consisiting of 50% chamber music an 50% solo music for harpsichord. For the first time in my life in making chamber music, I did not have the feeling that the fundamental of the harpsichord feels completely gone while playing as soon as other instruments join in. In all of the 3 different concert rooms (small village church, acoustically "dry" modern chamber music hall, bigger church with rich delay of the room) the feeling while playing never changed. The sound stayed completely resonant all the time for me. The first concert was visited by a singer of my church choir. He is very musically, but usually is a quite cynical man almost never expressing emotions. After the concert he could not stop saying how deeply moved he was. That for me was the strongest and most unexpected reaction of the weekend. The reactions of the people in the third concert concerning the harpsichord were as excited as in the other concerts regarding the solo pieces. So, your Taskin has proved to be outstanding not only at home, and I simply want to thank you again that you made such a wonderful sounding instrument for me. I feel to be a blessed donee!!!! Harpsichord after Blanchet opus 398 belonging to Elizabeth Farr . This is one of my most favorite decorations both to do and to look at - It is based on the Couchet double in the Metropolitan Museum of Art in New York City. The recording below was made on this instrument. Now you are able to view my "Opus List" by scrolling to the last entry on the ABOUT KEITH HILL page. Most of these harpsichords, clavichords, violins, guitars, and fortepianos continue to serve music as I intended them so to do when I made them. My chiefest aim has always been to build sounds that inspire a way of playing that deeply moves and excites listeners. This aim can be realized only by acoustical work of the highest quality. I define quality as anything that makes my instruments more like the antique instruments. Now that I have achieved my personal goal of a reliable mastery over sound, I am able to produce the kind of sound I could only dream of 40 years ago. It is that skill and understanding that I am able to bring to each and every instrument I make. It is this skill and understanding which makes my instruments unique in our time. That is what I have to offer. The photograph below is of a 1769 Taskin model harpsichord I built and decorated for myself in 2000, which recently sold to the University of Western Australia in Perth. The following performance is of my brother, Robert Hill, playing the first concert on that instrument in Perth. My chinoiserie on this harpsichord was inspired by seeing actual antique chinese decorated furniture . . . the result was both stunning and to my surprise made purposely dirty and mottled. I loved the effect because it makes the outcome so much more interesting. On the antique chinese furniture all what looked like real gold was actually a product made to imitate the appearance of gold by fusing mars yellow (iron oxide) on mica flakes. This harpsichord is now at the University of Western Australia in perth, australia. Here is a Sound Sample Bach's Sarabande in d minor from Robert Hill’s transcription from the solo violin Partita. The cardinal signs of a Hill instrument are: powerful tone, gorgeously vocal trebles, solid and resonant basses, beauty of tone color, intensely musical behavior of sound, flexibility of touch and color, and a singing and affectively "loaded" tone. Here is a Sound Sample of Bach's Fugue from his solo concerto in a minor played by Elizabeth Farr on my most recent 16' Harpsichord. The next Sound Sample is from CPE Bach's concerto for piano and harpsichord played on one of my Cristofori Pianos and one of my Taskin Harpsichords. Why are these traits necessary? It is obvious that players and composers in the 18th century demanded instruments possessing these qualities to be made so that they would aesthetically support their musical conceptions and intentions. How do we know this? CPE Bach states explicitly in his Versuch to "Play from the Soul, not like a trained bird...endeavor to avoid everything mechanical and slavish". J.J.Quantz in his treatise, On Playing the Flute, explains to musicians that "musical execution may be compared with the delivery of an orator..." and that musicians and orators should aim "to make themselves masters of the hearts of their listeners, to arouse or still their passions, and to transport them now to this sentiment, now to that". Pictured below are photos of the 1658 de Zentis harpsichord, which I restored in 2004 and which now resides at the Piccola Academy in Montisi, Italy, and of my most recent Italian Harpsichord- a copy of the de Zentis of 1658. Below the photos are sound samples, of the harpsichords pictured, played by Pamela Ruiter Feenstra, Martha Folts, and Elizabeth Farr, and Leonardo Garcia-Alarcon. I understand that they meant these things literally, rather than hopefully. Therefore, I build my instruments with the sole aim of creating sounds which enhance and support (meaning: to make reasonable, logical, and beautiful) a highly expressive, highly flexible, highly affective, highly inflected, powerfully communicative, yet balanced style of playing. Playing that is, in a word, soulful. Until I built this 6 Octave Cristofori Fortepiano, no one had ever attempted to take Cristofori's design to its maximum limits. It is double strung in Brass. The two pedals work the Dampers and the Una chord keyboard shift. This piano is my Opus 363 made in 2003 and finally completed and sold in 2007 to the Technical University in Trondheim, Norway. The recordings below were made by Marianne Ploger on this piano just before it was shipped to Norway. My goal now is to do everything in my power to encourage a return again to a sane, meaningful, highly expressive, masterful way of playing great music and creating great art. It is to this end that my instrument making is dedicated. I have posted an article I wrote some years ago titled "The Art of Listening" in which I explain my understanding of the nature of what it means to listen...not merely hear. You can read this article by clicking on the ARTICLES button under the main heading of this page and selecting the specific page. I wrote "The Art of Listening" as a chapter in my "Treatise on the True Art of Musical Instrument Making" but was told that my view on the business of listening had no place in my Treatise, so I removed it even though I disagreed with the few readers who thought it best not to reveal how I listen. I hope you enjoy reading it and that it reveals something that will help you improve your own skill of listening. I have been in the business of making musical instruments for 44 years. If you own an antique or vintage HILL harpsichord and have not had the instrument renovated somewhat recently, that instrument is in sore need of being renovated with new strings, new quills, and new dampers. This sort of work needs to be done regularly about every 15 years depending on time and use. I purposely assigned opus numbers to my instruments applying the label on the pinblock in the treble on most harpsichords and on the pinblock in the bass if there was no room in the treble. The reason first was to keep track of where my instruments were located and second to have a clear record of my development as an artist for my own use. In other words, if someone wrote to me and said they owned opus 34 and proceeded to describe something other that what my records indicated, I would tell them if their instrument was or was not genuine, as happened occasionally over the years. Third, and most importantly, was to demonstrate to those, who tend to attribute anything of high quality to one’s talent, just how wrong that is. I have had to work extremely hard to figure out all that I have come to understand about making a high quality sound, one that I personally consider worth listening to. Anyone who would think otherwise is wrong. And central to all that hard work is being attentive to intelligent criticism and figuring out how to use it. By this I mean not succumbing to the usual reaction to hearing criticism, which is, being offended. I consider the inability to hear, accept, and use criticism as the principle reason why most musical instrument makers make instruments that are not worth listening to. As one very fine violinist and critic of my violins recently told me, “You are one of the only violin makers I know who can actually accept and make use of criticism.” I responded by saying that I learned that lesson after having built my second harpsichord, that is, one can wallow in feeling offended or one can pay close attention to what is being said by the critic in order to improve the work. It is just a choice, nothing more. To begin, here are some useful definitions of words used in this article to describe age or date of the instrument and especially the kind of work needed. ANTIQUE means older than 25 years. Any Hill harpsichord built before 1991 is an antique. If you own an antique Hill instrument and you have not had any significant work done on it since it was made, then your instrument is in serious need of being reconditioned. VINTAGE means a particular period during which your Hill instrument was made. I delineate those periods according the degree of acoustical development and/or place or year in which your Hill instrument was made. 2004 - the present. This period involved another move, in 2010, to Nashville, Tennessee. 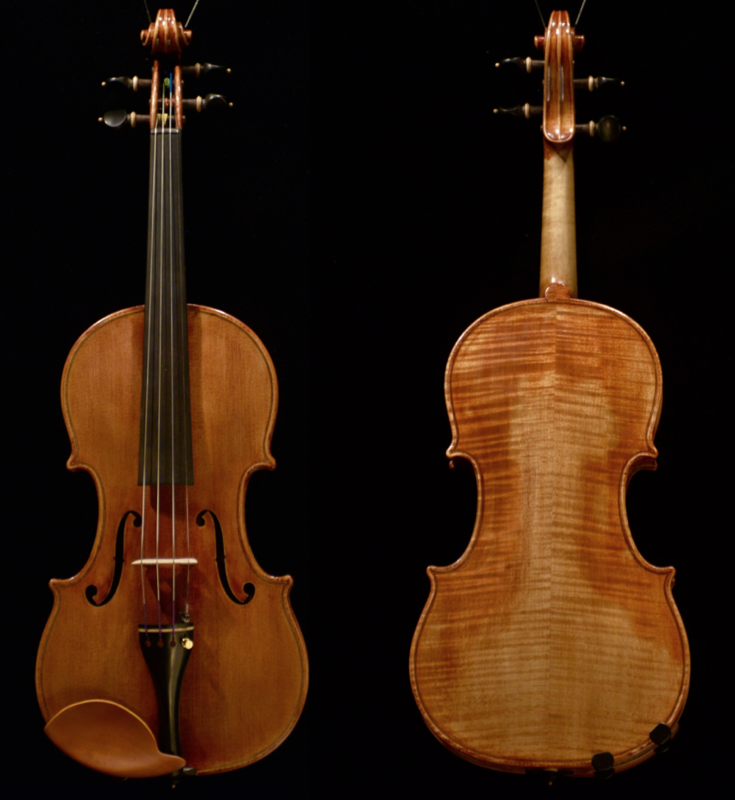 Opus 484 is my most recent instrument…a violin. Those harpsichords from Opus 350 and before, depending on the conditions in which your Hill instrument has been kept, will likely be needing to be restrung, requilled and redampered, in a word…renovated, unless that has already been done earlier, that is, sometime within the previous 15 years. RENOVATING - Means restringing because over time iron strings rust and brass strings corrode. Rust and corrosion act as an abrasive, which eats away at the tips of the quills causing the sound to become coarse and dull. This means the strings and the quills need to be replaced. Replacing all the quills with new quills often needs to be redone more regularly because over time many quills will have broken and were replaced by technicians who may or may not understand how to get the best sound from the instrument. Redampering is necessary if the damper cloth has been ‘eaten’ away by the strings. RECONDITIONING - Whereas renovating involves only those aspects of set up that degrade through time and use, a reconditioning includes renovating and can but not necessarily involve any or all of the following, things which I recommend, i.e. : replacing plastic jacks with wooden jacks (which produces an improvement in tone of about 5-10%), changing all the cloths and felts in the instrument with a special material called woven-felt (which produces an improvement in tone of about 15%), acoustically adjusting/tuning the keyboards (which produces an improvement in tone of about 15%), acoustically adjusting/tuning the jacks (which produces an improvement in tone of about 5%), and when the strings are off the instrument, unpinning the bridges and tuning as well as acoustically adjusting the bridges (which produces an improvement in tone of about 5%). REBUILDING - Usually involves replacing the soundboard, as well as everything done in a reconditioning. Since the soundboard has been removed, it also can involve acoustically adjusting the inside of the case and a re-engineering of the bracing system, should that prove acoustically beneficial. To assess the quality of an instrument I rate every possible enhancement on a scale of one to 100. 1% assumes that the instrument is a competent piece of woodworking. 100% means that the maker has divined every possible means of enhancing the sound of an instrument and has applied all possible enhancements. I always use the finest, best sounding great antique instruments from the 17th or 18th centuries as my acoustical standard and call them “100%” instruments. Why? Because the ancient makers did everything in their power to enhance the sound of each instrument they made. The Colmar 1624 Ruckers is an 85% instrument only because the maker who converted the instrument from its original condition in order to upgrade the compass and specifications was not particularly astute about all possible enhancements of the things that got changed. The de Zentis that I restored in 2004, now in Montisi, Italy was a 100% instrument until the original 17th century Ivory key tops had to be removed due to customs requirements in order to ship it to Italy. The Grimaldi in Nüremberg, Germany is a 100% instrument. The Jan Couchet in Brussels, Belgium is also a 100% instrument. The Ahaus Ruckers used to be a 100% instrument before it was degraded in restoration to a 65% instrument as the soundboard was removed to flatten it. The 1769 Taskin was a 100% harpsichord when I first played it 45 years ago. Indeed, most well restored working antique harpsichords average between being a 55% - 85% instrument, because not all makers from the Baroque period had a complete knowledge of how to enhance every part of the instrument. The old “serien” plucking piano type harpsichords commonly made in the 1930’s-70’s in Germany were only able to yield a 1-5% result. If the maker does everything any respectable furniture maker would do, by selecting the design and materials intelligently, the maximum result would be a 5-15% instrument. The best possible result most makers today can achieve, doing nothing to otherwise enhance the sound of the instrument beyond makinga jot and tittle copy of a piece of furniture, yields about a 15-25% instrument. For myself, I have always aimed to make 100% instruments, having figured that it is better to fall short of the mark than to not aim at all, yet also always assumed, no matter how good the sound might have been, its never good enough. So should you own an earlier Hill instrument and discover that my opinion of it may not be as high as yours, that is my artist’s prerogative. I see it as my job to have a skeptical ear, especially of my own instruments. Today, because I have done a few, a full rebuild of one of my earlier period instruments can yield a 65% - 80% result. A particularly good sounding example of my previous work can yield a 70% – 90% instrument. Each stage of reworking an instrument brings with it costs both for time and materials, and knowledge of how to create the best possible sound. The cost for renovating a double manual harpsichord is between $2100 - $4000, depending on the extent of the work and who does the work. A reconditioningof the same instrument costs between $5000 - $8,000. A complete rebuild costs between $15,000 - $22,000, depending on who does the work. This assumes no repair work needs to be done. Here are 130 + videos, that can be found of YouTube, in which my instruments are featured. I am sure that there are significantly more. That they do not appear in this list is probably because I have yet to either know about them of must accidentally discover them while browsing...not one of my favorite activities. J C F Fischer: Suite in D Minor 'Uranie', complete. Robert Hill, harpsichord by K. Hill 1988 after M. Mietke - strung completely in brass. Bach: Adagio Bb, Allemande A, Sarabande Em - Bradley Lehman Harpsichord and pedal harpsichord. Johann Sebastian Bach, Goldberg-Variationen, 2. Variation - Gerhard Oppelt spielt am Cembalo nach Ruckers, gebaut 1999 von Keith Hill. J. S. Bach - Toccata BWV 912 in D major- 2°JERMAINE SPROSSE - harpsichord Hill / Taskin Opus 317 1997. J. S. Bach - Toccata BWV 912 in D major- 1° JERMAINE SPROSSE - harpsichord Hill / Taskin Opus 317 1997. C. Ph. E. Bach - Sonata in a minor Wq 49/1 - 1° JERMAINE SPROSSE - harpsichord Hill / Taskin Opus 3171997. C. Ph. E. Bach - Sonata in a minor Wq 49/1 - 2°JERMAINE SPROSSE - harpsichord Hill / Taskin Opus 3171997. J. Ph. Rameau - Pieces de clavecin (1706) - 2°JERMAINE SPROSSE - harpsichord Hill / Taskin Opus 3171997. J. Ph. Rameau - Pieces de clavecin (1706) - 1°JERMAINE SPROSSE - harpsichord Hill / Taskin Opus 3171997. Bach - Brandenburg Concerto No. 5 in D major BWV 1050 Michael Behringer - Hill/Ruckers Opus 263 1992-3. J.S. Bach - BWV 1080 - (18) Fuga a 3 soggetti "B-A-C-H motif"
Jan Katzschke - Hill Lute-harpsichord.